Corrective action is needed to avoid serious damage to Australian ties with China. 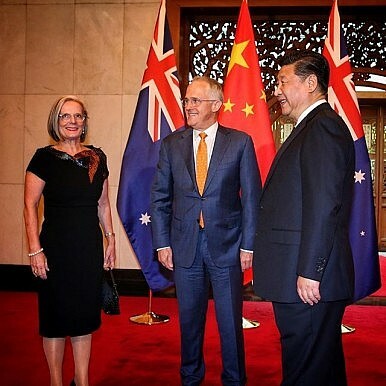 The ‘China choice’ debate has flared up again in recent weeks, with the Turnbull government displaying signs of confusion about where we draw the line between defending national security interests and promoting economic relations with Beijing. The handling of the Ausgrid sale has led to some Australian cringing in the face of arrogant language from a handful of Chinese officials. Peter Jennings took a useful lead in a recent opinion piece in The Australian. He urged the government to direct “its economic departments, intelligence agencies and Defense [to] develop a shared baseline understanding of China’s growing power in both its economic and strategic dimensions.” That would be a great step forward. Structured, focused and evidence-based policy is the best kind. Jennings is right to suggest that this appears to be missing in the public domain in respect of Australia’s relations with China. We need to take an equally critical view of the Chinese propaganda line about ‘peaceful rise’. This was always a purely propagandistic line developed by the Central Party School to reconcile China’s growing power with some competing and contradictory policy considerations. On the one hand, internationally, China needed to reassure its neighbors. On the other hand, at home, China had to constrain growing hawkish voices demanding to know why Beijing wasn’t being more forceful in relations with Taiwan, Japan and the United States. The ‘peaceful rise’ thesis was also directed at channeling Chinese public opinion toward a nationalist mindset in order to keep their attention on the economic growth achievements of the Communist Party and away from the steady deterioration in social welfare conditions and the environment. It was a convenient way for the Chinese leaders to conceal an inconvenient truth that it didn’t want to admit to its own people: China wasn’t as powerful as many of its military leaders believed and if Beijing were more combative internationally it would put at risk many of the international public goods (investment, technology, market access) considered essential to continued national prosperity. There’s a conundrum here. In recognizing that the line about China’s peaceful rise was mostly propaganda, we don’t have to conclude at all that China was secretly intent on a bellicose foreign policy. In fact, we can safely conclude the exact opposite. Under Xi Jinping, China has, as Peter Jennings has noted, abandoned the peaceful rise thesis. But the replacement policy isn’t necessarily militarism, as Jennings seems to imply. It may be something else. And the new levels of militarization by China in the South China Sea don’t necessarily define the new policy, they may be merely one tangential manifestation of it. That brings us back to a key question posed by Jennings. How then do we evaluate China’s power and new its foreign policy direction? I would urge the government to act on his recommendation for new baseline studies. I would also encourage ASPI take a lead in the research community by setting up a task force or study group of scholars with differing China specializations and divergent views of the China problem. There are two challenges here for the research community in Australia. The first is to redress the collapse in past two decades in the country’s universities and think tanks of detailed studies of China’s security policies. Second, we need to achieve a broad consensus on a policy framework to deal with China that can be transparent, durable, and effective in an era of almost inevitable uncertainty about just where China’s national security strategy is heading. This article was originally published at The Strategist. Alan's Boat From China: Episode 3US Allies Aren’t Buying Its New Strategies to Confront China5 Hidden Costs of the RCEP to People and PlanetAustralia’s China ChoiceIs Asia the New Silicon Valley?